Donate a Commemorative Brick or several and honor a loved one, memorialize a friend, list your name, pen well wishes to Koinonia, or be creative! 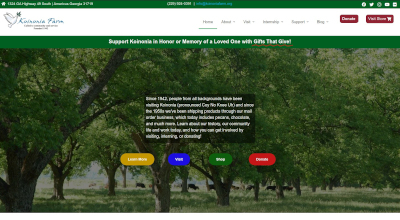 Proceeds support Koinonia's ministries and will help to build a path and prayer garden all over the farm. Cost is $75 for 4x8 brick with up to 3 lines, 18 letters per line including spaces; $150 for an 8x8 brick with up to 6 lines, also 18 letters per line including spaces. This purchase is considered a donation and you will receive a tax-deductible receipt. You may also add a certificate to be mailed to you or to the person/family you are honoring ($10). Replica bricks are also available- these are perfect for displaying on a desk or bookshelf! ($50). Address to send certificates and/or replica brick. You can only order one brick at a time. Please click "Add to Cart" to purchase one brick and then after the green banner across the top says "Successfully Added to Cart," fill out the information for your second brick.